In stark contrast to the prevalent general view, the results of the OPINION POLL conducted by SINDHISHAAN'S e-newsletter 'PRERNA' revealed a startling and surprising although endearing view point held by registered members on www.sindhishaan.com. A latent and simmering yearning for a State or Union Territory in India that the Sindhi community could proudly proclaim as its own is glaringly evident. And this desire does not seem to recognize barriers of age but is also expressed by the second generation after the Partition of 1947. This is certainly a CLARION CALL for the stalwarts of the Sindhi community that it is never too late to make amends and NOW is as good a time as any to set the ball rolling. 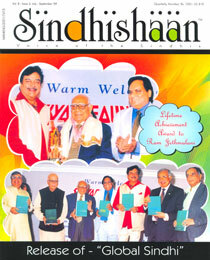 The results in detail are carried in this issue and SINDHISHAAN invites its readers’ feedback and suggestions. Switching tracks, it is always a feeling of great joy and pride to witness an associate set for himself a scorching pace and earn accolades in his chosen profession or field. So is the case with SINDHISHAAN. Kaviraj Khialani, who has been associated with SINDHISHAAN since inception, has achieved praiseworthy acclaim and fame in his field of culinary art and is now mentoring “LG- Mallika-e-Kitchen” - the new food reality show on Colors TV. With this issue we continue with the column 'From my Desk' after a gap of 6 issues, with the column being now written by Dr. Nandlal Jotwani, brother of late Dr. Motilal Jotwani. SindhiShaan remains indebted and grateful to the Jotwani brothers. 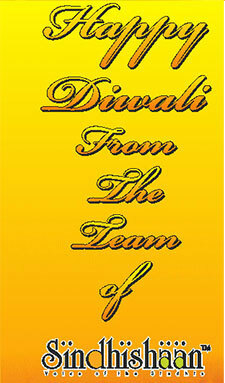 I wish you dear readers seasons greetings and best wishes on the occasion of Diwali. I will not keep you any further from delving into the power packed contents of this issue – HAPPY READING.